Review in a Nutshell: The Wrath and the Dawn is a beautifully written, mesmerizing retelling. This book will capture your heart. The Wrath and The Dawn follows Shahrzad al-Khayzuran, known as Shazi, who had just lost her best friend to the mad boy king. Every night, for three months, he has married a new bride, only to have her hung by dawn the next day. Shazi volunteers to be his next wife, and plans to avenge her friends. However, what she least expected was to fall for the monster. 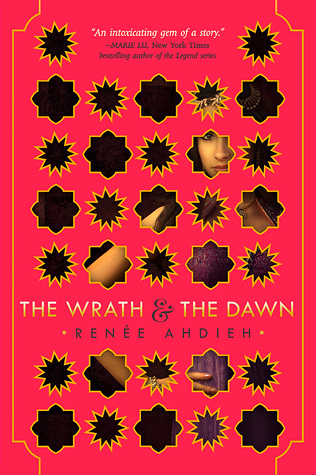 Renee Ahdieh crafted a beautiful world inspired by Middle Eastern culture, with captivating magic and fascinating politics. She captures the culture beautifully and completely immerses you in the setting. The writing in this novel is absolute perfection. Ahdieh writes in beautiful and vivid prose. There are very few authors whose writing style is as spellbinding as hers. Every line is gorgeous. The plot of The Wrath and the Dawn was inspired by 1001 Arabian Nights, but there is so much more. Ahdhieh delicately weaves several points of view and storylines, revealing just enough to keep you desperate for more. There is a perfect blend of politics, romance, mystery and magic. This book has no dull moments. I absolutely love the two main characters in this book. Shazi is an incredibly strong protagonist. Her bravery and determination are admirable. Khalid is just fantastic. I can’t say too much about him- I won’t risk spoilers- but he has so many complex layers. Honestly, every character is extremely complex, with different motivations and goals. There is no one-dimensional character, and even the villains aren’t completely atrocious when you know what they’re fighting for. Also, I need to mention the main romance. It is adorable. It never feels rushed and is a perfect mix of precious, heartbreaking, and compelling. Cons- I have nothing for this. It’s too perfect. The Wrath and the Dawn is sure to steal your breath and transport on an amazing adventure. I could not recommend it enough. OMG YES. I am so glad that you loved this book so much! It’s so amazing! I can’t wait to read her new book coming out in 2019! !